Satan's Army threatens England. Only one man can stop the demons before it's too late: Sherlock Holmes, consulting detective. "London After Midnight 2: Sherlock in Hell" is a fun, fast and brutal card game, set in the Victorian era. 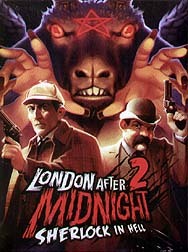 It can be played as a stand-alone game or with the original "London After Midnight" for even more craziness.